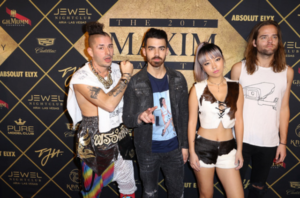 The MAXIM Super Bowl Party 2017: DNCE, Fergie, DJ Khaled, Ludacris and more! Hollywood headed to Houston for the weekend to cheer on their FAV team at Super Bowl LI, but before the Patriots and Falcons took the field, celeb fans got the party started early at the MAXIM Super Bowl Party 2017! The MAXIM Super Bowl Party, presented by Thomas J. Henry and produced by Karma International, was held at the Smart Financial Centre last night in Sugarland, Texas. The venue is a state-of-the-art, brand-new facility in the greater Houston area, which accommodated over 4,500 tastemakers and VIP’s for this party. 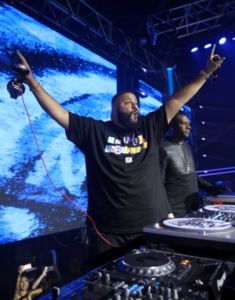 The exclusive affair included attendees like hip-hop recording artist Travis Scott, DNCE, Fergie, Nick Cannon and more, and featured a deejay set by DJ Khaled, strolling performers, and aerialists! Art, fashion, music and sports all simultaneously collided for the ultimate immersive experience. Monster Energy presented two interactive areas featuring the Monster Energy FMX Motorcycle Show and the Monster Energy Lounge with energy drinks that kept attendees hyped throughout the course of the entertaining affair. 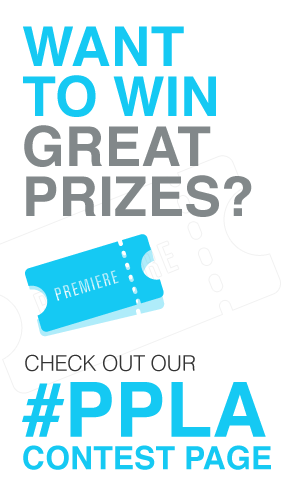 MAXIM featured the “2017 MAXIM Party ARt Exhibit” experience powered by Aireal, which displayed mixed-medium, 3D painted art where users were able to interact with the art via their mobile device. Additionally, America’s favorite beer, and the official beer of the NFL, Bud Light, offered refreshing beverages for all guests to enjoy. Specialty cocktails were also provided by Absolut Elyx and Tequila Avíon. Champagne was flowing throughout the night courtesy of GH Mumm and Perrier Jouet. Zippo also had their “Zippo Car” on-site so partygoers could engage in fun and frisky photo opportunities. They created a custom one-of-a-kind MAXIM Party lighters that they gave away to select celebrities, influencers and VIPs. 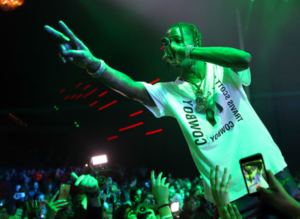 Further, The Jewel Nightclub from Aria Resort Las Vegas facilitated bringing Travis Scott to the MAXIM Party 2017 line-up to add to the over the top luxury nightlife style experience. Lastly, VIP’s came to and from the party in Cadillac’s finest vehicles while our silent auction added a charitable component to the event, where proceeds benefitted the Tree Media Foundation, a non-profit organization committed to educating the public on environmental issues. In support of Tree Media Foundation, New Orleans visual artist Randy Leo Frenchette, better known as “Frenchy”, painted live on-site where his captivating artwork was auctioned off. Again, proceeds from the silent auction ultimately benefitted the foundation. Fashion vignettes were elegantly presented by Lyndon London & Danny Nguyen Couture – guests noshed on Max’s Wine Dive, while indulging in delightful desserts provided by Sprinkles Cupcakes, macarons by Patisse, and Frost 321 Spiked Ice Cream.